Misty's Rain Drop is Rainbow's last foal, and her only non chestnut offspring. She was named in honor of Rainbow's lost sister Raindrop. Rain Drop is sired by Red Elvis, a bay stallion who also sired Misty's Desert Sun. Rain Drop has the feisty personality that Rainy's descendants are known for. Rain Drop is was born on the Allen's farm in Pennsylvania and later moved with them to Virginia. She is pictured as a foal at a show in Chincoteague Ponies by Victor Gentle. Rain Drop spent several summers at the Chincoteague Pony Centre and has been a member of the Chincoteague Pony Drill Team. Rain Drop has had three foals and they were all sired by Cezanne. Misty's Storm Chaser, a black pinto filly born in 2003, Misty's SnowDrop, a chestnut pinto filly born in 2006, and a chestnut pinto gelding named Misty's Thunderbolt in 2008. The first year Sara Miles worked at the Chincoteague Pony Centre she fell in love with Rain Drop and several years later she got permission to take her home to show her. 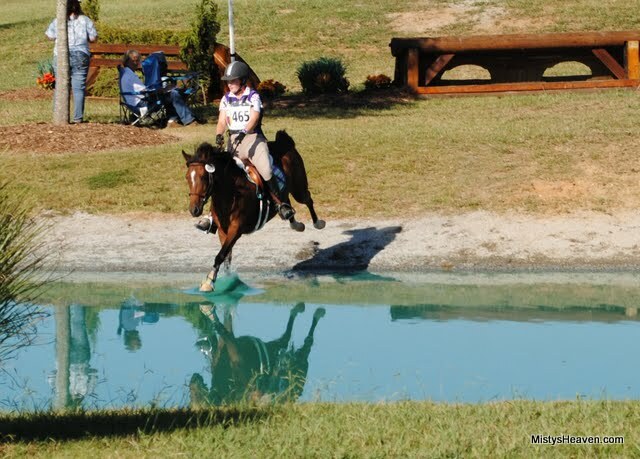 Sara trained Rain Drop for eventing and they have been successfully competing in the Beginner Novice and Novice levels. In 2011 and 2012 the pair competed at the American Evening Championships. Several news articles were written about their trips to the AEC's. In 2014 Rain Drop officially changed hands and she is now owned by Sara. Misty's Rain Drop unexpectedly passed away May 17, 2017.